“With the multi-headed, ADHD dripping Gods of Consumerism slowly but surely pushing the old religions out, where do we turn when we lose our faith? With Heaven so far away, are there enough worldly pleasures to drape ourselves in? Is the world coming to an end or are we? The gas mask protects, not just our lungs, not just our identity. 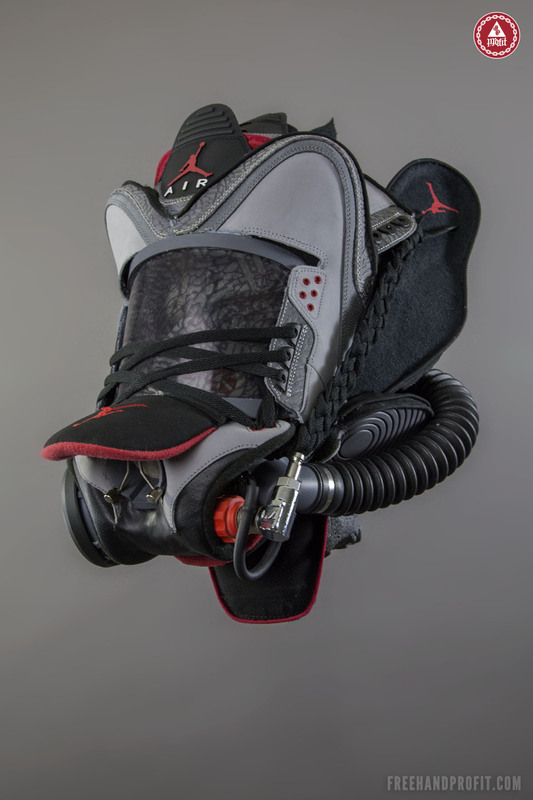 The Air Jordan “Stealth” III Gas Mask is the 86th sneaker mask by Freehand Profit. Created from a single pair of the 2011 Jordan Retro, the “Stealth” color way featured classic tones of grey, black and red but the addition of a white sole & white laces found a normally coveted shoe on outlet racks. In fact, Freehand Profit picked up both the pair used for this mask and a pair for himself for well under retail while visiting his family and hometown in Northern Virginia. If you’re in the DMV this weekend don’t miss SneakerCon DMV, I’ll be doing a live chop and we’ll have some rare, unreleased and exclusive pieces to show and for sale. The “Stealth 3” Gas Mask was commissioned by a private collector, all pieces are 1 of 1 so this mask is no longer for sale. To find out more about purchasing or commissioning artwork from Freehand Profit CLICK HERE – or – Hit the official online shop at freehandprofit.bigcartel.com. How much for the mask? R u selling it ?